Our website (trackingshipment.net) is not affiliated with Emirates Post. Please be advised that Emirates Post tracking service has just been added to our service and we haven't enough time to collect a lot of information about popular questions. At the moment all results are being represented without our correction. You can ask any question about it, we will find an answer on it. We will make FAQ in the short time. 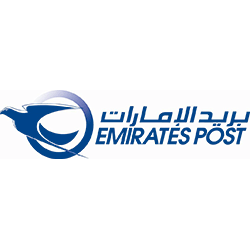 Emirates Post is the biggest official postal provider in the UAE. It is a branch of Emirates Post Group Holding. The company was founded in 1909 and was a subsidiary of Indian Post until 1947. However, only 1972 is considered a year of the creation of General Directorate of Postal Services of the UAE. It was founded in 2007 and now it encompasses 4 separate companies – Emirates Post, EDC, Wall Street Exchange and Empost. The company provides clients with different kinds of facilities. Emirates Post is constantly trying to follow the recent trends in the global postal services. Certainly, except for the local postal services, it offers international shipment delivery. Of course, the company has its mission and philosophy. Regarding the mission, the company wants to provide customers with excellent and convenient services. Certainly, to achieve its goals the company greatly relies upon its highly qualified and dedicated personnel. Naturally, when you send a parcel or someone else sends you a parcel you wish to know where it is at the moment and when you’ll receive it. One should not worry about the safety of a parcel, so far as at any time one may check the location of a package online using Empost courier tracking system. The easiest method to find out information is to visit the official website of the corporation and use Emirates Post track system. To get information about your package you have to enter a special tracking number. To use Emirates Post courier tracking web service is the second possible way to monitor parcels. Emirates Post courier is a useful system, which can provide you with a fast response about the package locality. However, most people prefer using universal databases. k2track is one of the most efficacious and reliable portals. Using this system you can be always sure that you receive updated information.